Quaker Oats has launched an initiative, Start With Substance, to help you help others while enjoying the oatmeal you already know and love. From January 12-February 28, Quaker will donate one bowl of oatmeal to the hungry for every UPC code entered on their Facebook page. 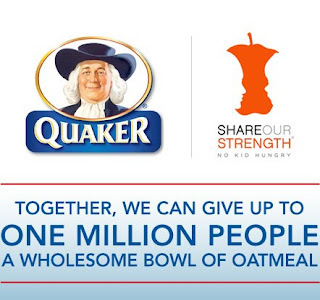 With your help, Quaker and their partner Share Our Strength, an organization dedicated to ending childhood hunger, hope to distribute one million bowls of oatmeal to those in need. For rules and more information, visit Start With Substance. I'm following you from Beautiful! Fabulous! I'll get my guinea boy to face off with Quaker Man this weekend. Quaker Man is such comforting image, isn't it? I have tried and tried to like oatmeal, sadly I like it only in cookie or other dessert form. I am super frustrated...not at Quaker, but since I've changed my blog look, I can't put the link to your blog on my site. It says it's a dead link. Argh! What's the deal?! Anyhow, I can't believe how big the kids are getting. Be glad you're not here. We are literally frozen. Cute kids! My son loves oatmeal now but when he was about 5 he used to hate it. I would put fruit in it but that didn't help.